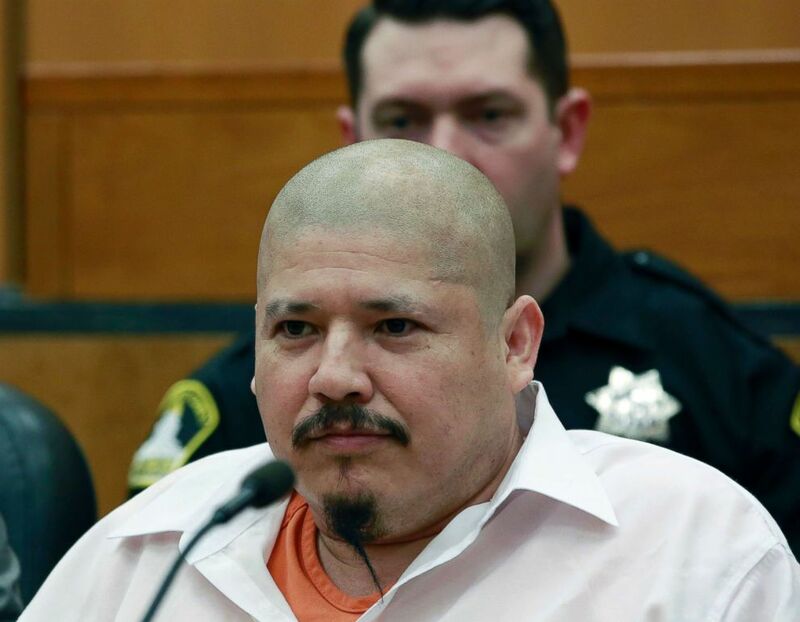 President Donald Trump has pushed the boundaries of campaign finance rules with a controversial new video that accuses Democrats of blindly opening U.S. borders to undocumented immigrants, even those who kill police officers. Unlike typical political ads, nowhere in this video does the president declare who paid for it. Campaign finance experts said that by limiting it to his social media feed, Trump has found a gap in campaign finance laws that are intended to let voters know who sponsors the messages they see. "There is some ambiguity about when a disclaimer is required for ads posted exclusively on social media, and the Trump campaign may be trying to assert a loophole," Brendan Fischer, who is in charge of the government reforms program at nonprofit Campaign Legal Center, told ABC News. Luis Bracamontes glares at the jury as the verdict is read in the killing of two law enforcement officers in Sacramento Superior Court, Feb. 9, 2018. An official with the Republican National Committee told ABC News that the video was produced for the Trump campaign. The Trump campaign did not respond to ABC News' request for comment on the video. The 53-second video released Wednesday evening remains pinned to the top of the president's popular Twitter feed. It features Luis Bracamotes, who was sentenced to death in April after being convicted of killing two California sheriff’s deputies in 2014. With a menacing smile, Bracamotes said he's going to "kill more cops soon." And the video claimed "Democrats let him into our country" and "Democrats let him say." The video, accompanied by Trump’s own message, "Vote Republican now!" immediately sparked controversy -- critics have called it racially charged and aimed at stoking fear at a time when Trump is pushing hard-line anti-immigration policies in response to a mostly peaceful migrant caravan traveling through Mexico. Under current law, campaign ads are generally required to include disclaimers that clearly state who paid for the ads. Those rules are partly in place to address concerns that politicians could try and distance themselves from harsh attack ads, so as not to muddy themselves in the process. Ads from PACs with vague names that don't make their allegiance clear have long made it difficult for the public to figure out where the ads are coming from. With the rise of social media, campaigns and PACs that post ads on their social media accounts have brought a whole new grey area in town, according to experts. 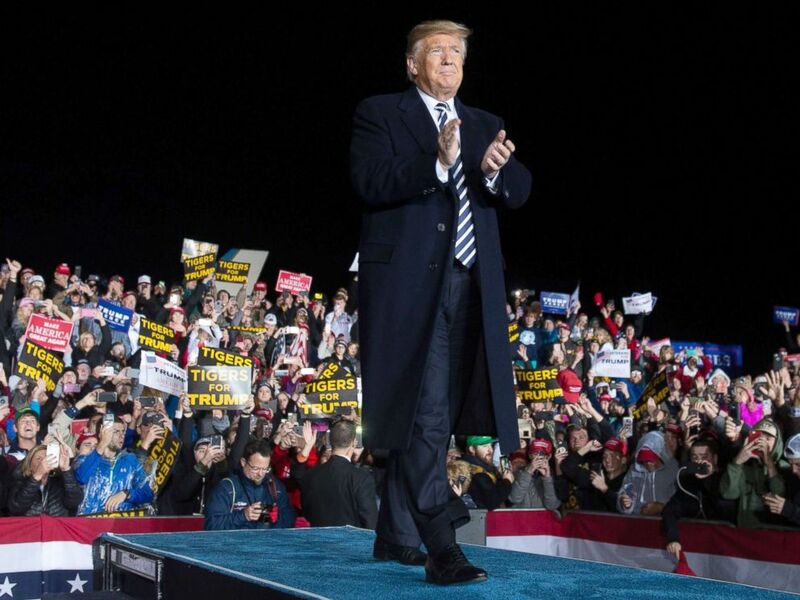 President Donald Trump claps as he arrives to speak at a campaign rally at Columbia Regional Airport in Columbia, Missouri, Nov. 1, 2018. "This shows there appears to be a gap in the law – a presidential candidate like Donald Trump could be blasting out these campaign commercial-like videos to millions of views, but viewers would not have real-time information about who is paying for them," Stephen Spaulding of government watchdog group Common Cause told ABC News. On the same day Trump tweeted the Bracamotes video, he also posted a similar campaign-ad styled video on his Twitter feed with a hashtag #JOBSNOTMOBS. "So, we might start seeing a new trend of political campaigns blasting out videos to millions of viewers and voters will not have information to know who is paying for it to better evaluate the message," Spaulding added. Digital advertising has played a major role in Trump's political messaging efforts. After spending at least $85 million on digital consulting and online advertising during the 2016 election cycle, Trump's team launched an aggressive digital operation for his re-election campaign led by new campaign manager Brad Parscale. According to Federal Election Commission records, the Trump campaign alone has spent at least $10 million on digital consulting and online advertising since 2017.